Adding to charitable efforts that have been a cornerstone of the company's business since it opened in 2004, Rahr & Sons Brewing Co. of Fort Worth has partnered with charity: water to help bring clean and safe drinking water to people in developing countries. To date, charity: water has build more than 20,000 wells in 24 countries, supplying clean drinking water to over 6 million people. As part of this initiative, Rahr & Sons will be involved in selecting the regions where the wells it supports will be constructed. "Charity: water is an important organization that has a long-term outlook to make sure water is plentiful for years to come in areas that need it most," says Craig Mycoskie, Rahr & Son's vice president of operations. "Rahr & Sons is excited to expand our impact and help bring life's most basic need to those who desperately need it." 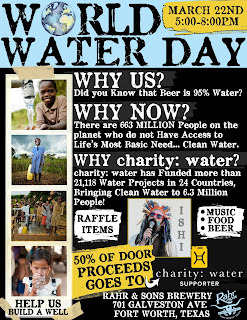 A launch event celebrating the new partnership will be held at the brewery on World Water Day, March 22 from 5-8 p.m. 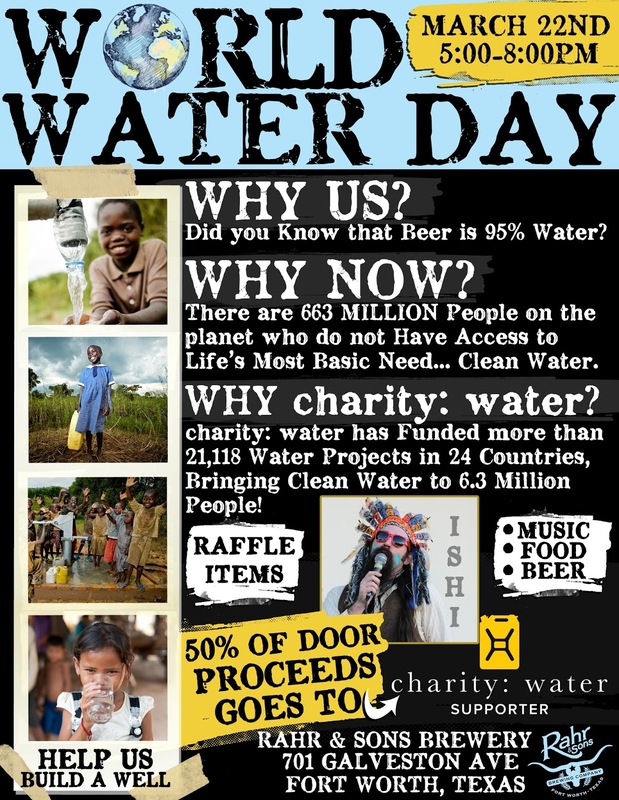 The brewery has set a goal to raise $10,000 in its first week, which is the amount necessary to build a single well. To reach that, Rahr & Sons will donate five dollars from each ticket sold for the March 22 event, as well as 100 percent of funds obtained from a silent auction featuring prizes from local businesses. Labels: charity, press release, Rahr & Sons Brewing Co.